Very specific to its time, to the events of those months from September to June, and to the scholarly projects of that particular set of Fellows. No madeleines, but the red pepper soup that was one of the cook’s specialties for lunches. The villanelle (Italian for “rustic”) is a pastoral song whose recurring lines and interlocking rhyme scheme create the ideal vehicle for Adam Giannelli’s paean to the past. According to this lament, we can never truly go home again, not even in our minds. 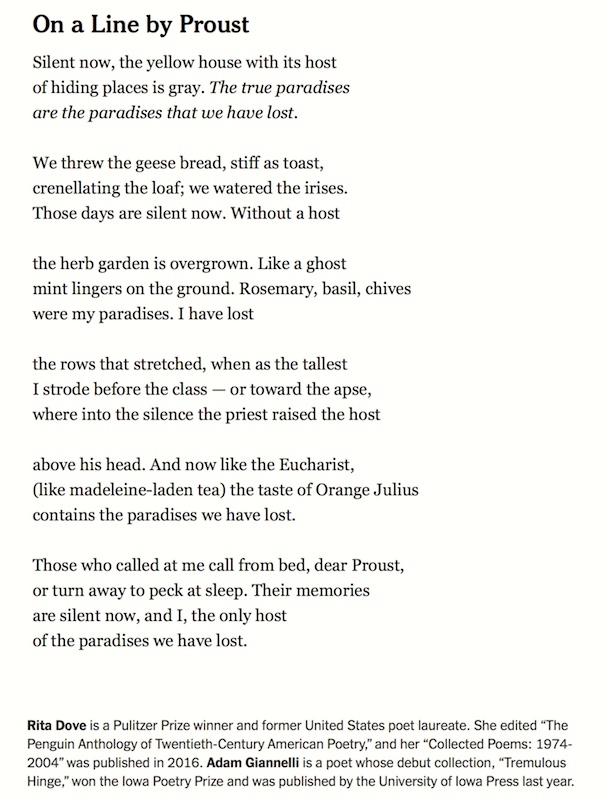 Just as gardens wither and beloved figures depart into memory, so do the poem’s rhymes: The ingenious pairing of “paradises/irises” devolves into “chives/apse,” while the pure trinity of “host/toast/ghost” dwindles to “tallest/Eucharist/Julius/Proust.” Eventually we’re left with the villanelle’s twinned refrain — until even these wisps of sound recede. 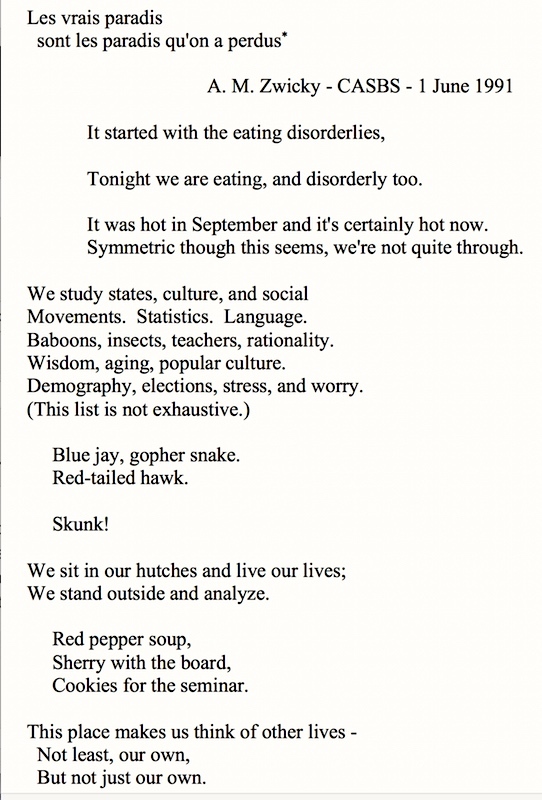 Beautifully constructed: the villanelle comes undone as it proceeds. where letters (“a” and “b”) indicate the two rhyme sounds, upper case indicates a refrain (“A”), and superscript numerals (1 and 2) indicate Refrain 1 and Refrain 2. This entry was posted on September 17, 2018 at 6:08 pm and is filed under My life, Poetic form, Poetry. You can follow any responses to this entry through the RSS 2.0 feed. You can leave a response, or trackback from your own site.